Welcome to our latest newsletter, with updates about Drax Power Station, subsidies for biomass, cellulosic biofuels and a few things we’ve been getting up to internationally. Please read and share and, as always, contact us if you would like to get more involved in any aspect of the campaign. 6. 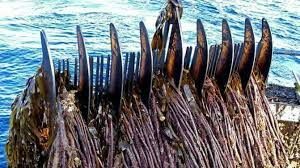 Ensure that mechanical kelp dredging does not happen in Scotland! Thanks to everyone who submitted Representations to the Planning Inspectorate about Drax Power Station’s plans to build a new 3.6 MW gas-fired power station in the place of its final coal-burning units (which are slated for closure by 2025). 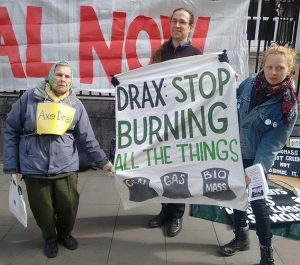 If this development goes ahead, Drax will lock us in to burning fossil fuels for another generation as well as continuing to burn millions of tonnes of imported wood pellets every year. We also published an Open Letter to the Planning Inspectorate, (and the Secretary of State) signed by 80 organisations who are all concerned about the continuation of burning biomass and fossil fuels. If you are part of an organisation that would like to sign on to the letter too, please contact us. 2. Subsidy changes set to end biomass power expansion in the UK! After many years of campaigning against renewable electricity subsidies going to biomass, we’ve finally had a first big success: following a Government consultation in which around 1,500 of our subscribers took part, rules for future subsidies have been changed, making it all but impossible for new biomass power plants to attract such support. The new rules set such a high bar regarding efficiency and greenhouse gas emissions that no existing plants would meet them – except perhaps for very small, highly efficient combined heat and power plants sourcing domestic wood. The only types of biomass plants exempt from the tough new efficiency rule are gasification and pyrolysis plants. There is another consultation about those ones and we will post an update when that decision has been made. However, those plants will still have to meet greenhouse gas standards which we believe will prevent them from using imported wood pellets. In practice, this means that a massive new biomass gasifier proposed by Orthios Energy in Holyhead, Anglesey, will almost certainly not be built. And because the overall pot of money – or pot of future renewable electricity subsidies – remains the same, money that would otherwise have gone to new biomass plants will likely go to offshore wind instead, resulting in real carbon reductions. This government U-turn should be read as a signal by other countries thinking about emulating the UK’s bad biomass example. But we still have a long way to go: Drax continues to cash in on £2 million in subsidies every day. Two new huge biomass plants, in Teesside and Northumberland will soon open and get big subsidies guaranteed before the recent decision was made. 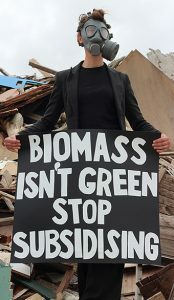 This is why we will soon launch our campaign to Scrap Biomass Subsidies (see below…). To find out more about the subsidy rule changes, see here. While the news about new subsidies is positive, and shows that we can make a difference, it doesn’t affect the vast subsidies already granted under the previous scheme (called Renewable Obligation Certificates, or ROCs). Without these subsidies, large import-dependant biomass power stations such as Drax would find it very difficult to keep going. This is why Biofuelwatch is launching a renewed campaign to Scrap Subsidies for Burning Wood in October. There will be lots of opportunities for supporters to get involved, including running workshops or public meetings in your local community, organising screenings of the documentary “Burned: are trees the new coal?” or lobbying your local MP. Look out for another message about this soon, or contact us if you want to help prepare for this campaign. 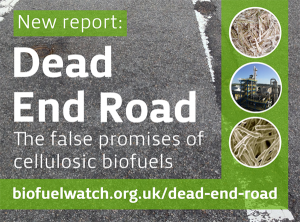 Biofuelwatch has published a new in-depth report about the false promises and the failures of cellulosic biofuels. The report looks at the history of such biofuels (dating back to the world’s first ‘commercial’ cellulosic ethanol plant in 1910! ), and it examines each of the 11 commercial-scale refineries supposedly commissioned or ‘operational’ since 2010. It also looks at the risks posed by the development of Genetically Engineered Trees and GMO microbes by biotech companies which have seen their funding boosted by the hype about biofuels made from wood, grasses or agricultural residues. Click here for the links to the report and the Executive Summary. Last Friday, September 21st, marked the International Day of Struggle Against Monoculture Tree Plantations. See here for an interesting article by Oli Munnion from Biofuelwatch about wildfire, eucalyptus plantations (AKA “green deserts”) in Portugal and more false solutions to climate change. Along with more than 100 organisations worldwide we support the position paper from Stay Grounded, outlining 13 steps for a transition towards a transport system that is more socially just and ecologically sustainable.We also recently became a member of Stay Grounded. Biofuelwatch has organised open letters on aviation biofuels which contributed in 2017 to the International Civil Aviation Organisation (ICAO) Member States rejecting plans for 50% of aviation fuel to be supplied by biofuels by 2050. In June 2018 we gathered 90 organisations to protest against ongoing plans to secure greenwashed future expansion of the aviation industry via Carbon Offsetting and Reduction Scheme for International Aviation (CORSIA). The fight is ongoing. The recently founded and growing global network is working to curb the unrestrained expansion of the aviation sector that is causing ever increasing damage to the climate, to biodiversity and local residents. The network is made up of local airport opposition groups and frontline communities, NGOs, trade unionists, academics, climate justice activists, and groups supporting alternatives like night trains. From 1-12 October 2018, Stay Grounded action weeks take place in about 15 countries around the world. They will show that resistance against new airport infrastructure and aviation growth is rising. The network will send a message to policy makers and the industry, rejecting the greenwashed aviation strategies being fostered right now, like CORSIA, carbon trading and tanked biofuels. Also on 1st October, a global network of over 70 NGOs including Biofuelwatch will be launching a position statement on forest biomass energy. The position statement had its first outing in the US at a meeting of the Environmental Paper Network in Asheville, and is the result of many months of networking and wordsmithing. We hope that it can be used by a wide range of groups to articulate a better vision for forests, the climate and communities. Later in October, watch this space for an International Day of Action against the greenwashing of the Biofuture Platform, organised by a coalition of groups including Biofuelwatch. The Biofuture Platform is a coalition of national governments and private sector organisations intent on ‘advancing the bioeconomy’ (i.e.,bioenergy along with a variety of short-lived ‘bio products’ whose climate impacts are as bad as bioenergy). We will be joining a wide coalition of groups worldwide in rejecting this high-consumption, high-carbon and land-hungry false solution to climate change.